You’ve earned the right to cry over this. 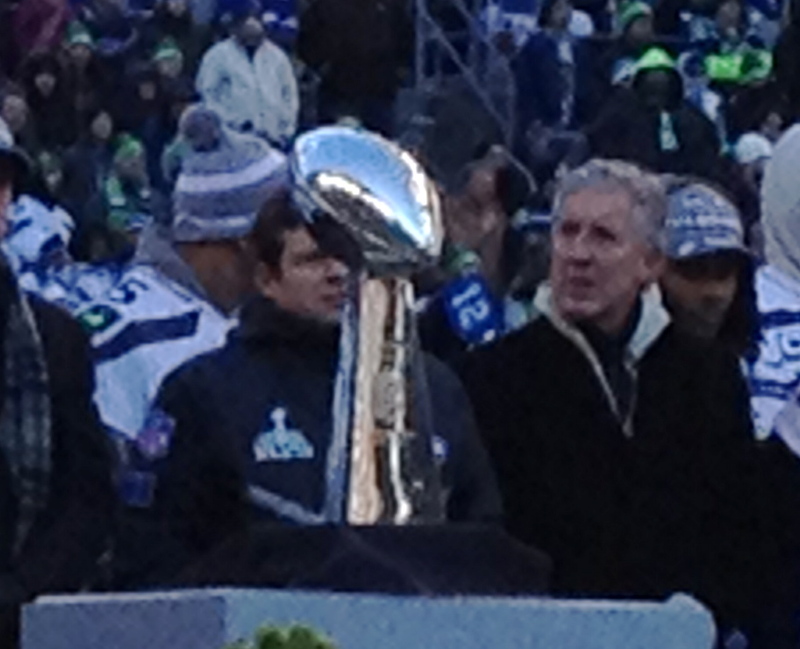 Super Bowl XLVIII trophy and the guys who made it happen. Several years back Bremerton got a Popeyes chicken restaurant and for a few weeks the lines were atrocious. One of my bosses asked if there had been a pent-up demand for Popeyes. Apparently, but that’s nothing compared to the demand in Seattle for the silver football. The projected numbers kept growing. It went from an expected to 300,000 to a half a million on Tuesday. The lines at the ferries made it easy to believe the other estimates that came out on Wednesday, that the crowd was up to 700,000. During the party at CenturyLink Field Paul Allen said it was a million. If Allen was wrong he can be forgiven for not really identifying with numbers less than a million. He can also be forgiven because Seattle was celebrating in the house he and you, the taxpayers, built. Whatever the numbers, they were massive. If there weren’t a million people downtown, it sure felt like it. Imagine if all those people who tried to board boats around Kitsap and trains in the areas surrounding Seattle had managed to get on. It was cold, it was crowded and it was beautiful. I saw someone posting on Facebook a wish that we could gather that many people for something perhaps more noble. That’s a worthwhile dream, but let’s not spend a lot of time feeling bad about this. I certainly don’t have a mind sharp enough to tell you why it is we care so much about sports, I just know I’m as big a sucker for this as anyone. Charlie Peach of Bainbridge Island told me he cried when Percy Harvin ran the second-half kickoff back for a touchdown. I haven’t been a Seahawk fan as long as he has. He was a fan when the team was launched. I jumped on the bandwagon in 2003, when I heard on the radio some guy talking about wanting the ball so they could march down to score. You know what I’m talking about. Despite my relatively recent adoption of the Seahawks, I’ll confess that I kind of cried too when Harvin scored. I wanted this win as bad as you lifers, because I wanted it for you. I grew up somewhere else and have seen my teams win it all. A lot of you, including a few of my cousins, had not. I know the Storm won two titles, but as Nathan Joyce wrote before the Super Bowl, those titles have not filled the void that has been building since the Sonics won it all in 1979. Sunday was a good day. So I wasn’t at all surprised to hear the outrageous estimates of the crowd size in Seattle. This victory was special. If the team gets more, the parades and the rallies in the future probably won’t be as well attended. It will still feel great, but this one is special. Years of frustration, at least in football, are over. America gets to kiss your ring, Seattle. For years you’ve been able to talk about your teams’ greatness, the 2001 Mariners, the 2005 Seahawks, the 1996 Sonics, and everyone else could ask to see the trophy. Now you can show them the proof. And you can puff out your chest and declare yourself a champion. And don’t be surprised if every time you see the replay of Harvin taking that kickoff to paydirt you shed another tear. Over the past 38 years you have earned the right to be emotional about this. Editor’s note: This piece was edited to include the mention of the Seattle Storm and to correct the year figure in the last sentence. While we’re discussing this a little bit, let me mention the video. I wasn’t prepared to take video yesterday. That was going to be another reporter’s role, but that reporter couldn’t get on the ferry. Not getting on the ferry became the main story and Josh Farley did an excellent video on that topic. I was left to my own device, my iPhone, which kept running out of juice at inopportune times. That’s why there is no video from the ceremony itself. I have a tape of the 95 Mariners and I cry every time I watch it, which hasn’t been for ages. I need to watch it again.